Transportation | Illingworth & Rodkin, Inc.
Illingworth & Rodkin has conducted numerous noise, air quality, and greenhouse gas emission studies for highway transportation projects, ranging from small intersection or ramp improvement projects to the construction of new highways to highway expansion projects stretching as far as 36 miles in length. 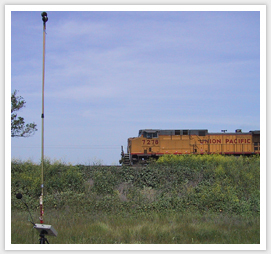 For noise studies, we conduct field investigations, develop traffic noise models using the Federal Highway Administration approved traffic noise model (TNM), assess impact abatement/mitigation, and prepare noise study reports in accordance with the State DOT and local traffic noise analysis protocols. Additionally, we are able to aid with the selection of pavement for purposes of noise reduction. For air quality and greenhouse gas studies, we establish existing air quality conditions, identify regional air quality impacts, analyze CO Hot Spots, assess project GHG emissions and mobile source air toxics, and address construction air quality impacts.